Evi Hartmann (born in 1973) studied industrial engineering and management at the University of Karlsruhe. After spending time researching at the University of California and the Haas School of Business in Berkeley, USA, she received her Diploma in 1997. Evi Hartmann obtained her doctoral degree at the Institute for Technology and Management at Technische Universität Berlin in 2002. From 1998 to 2005, she worked as a consultant at A.T. Kearney. She was then appointed assistant professor of purchasing and supply management at the Supply Chain Management Institute of the European Business School, International University Oestrich-Winkel, where she was awarded her habilitation in business studies in 2008. 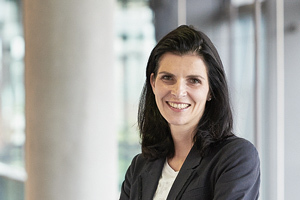 She holds the Chair of Supply Chain Management at Friedrich-Alexander-Universität Erlangen-Nürnberg (FAU) since 2009. Her primary areas of research include environmental supply chain management, global sourcing and strategic foresight. Her research approaches are practical and realizable, as numerous research projects and strong collaboration with industry partners show.